People like to say that love is blind, and no saying could be more accurate when it comes to women in emotionally abusive, toxic relationships and marriages with men who have narcissistic personality traits. Many victims of narcissistic abuse live in a state of perpetual denial, in which they are able to hyper-focus on memories of times when their abuser behaved in ways meant to present themselves as considerate, conscientious, and caring. Unfortunately, the lies these women tell themselves in an effort to maintain the illusion that they are safe in their own home and in their closest relationship are a dangerous form of self-harming behavior. Early manipulative behaviors like “love bombing” and vivid, typically passionate memories emblazoned on their minds (along with those addictive love chemicals), become the idealistic dream of what was meant to be they just can’t seem to let go of. 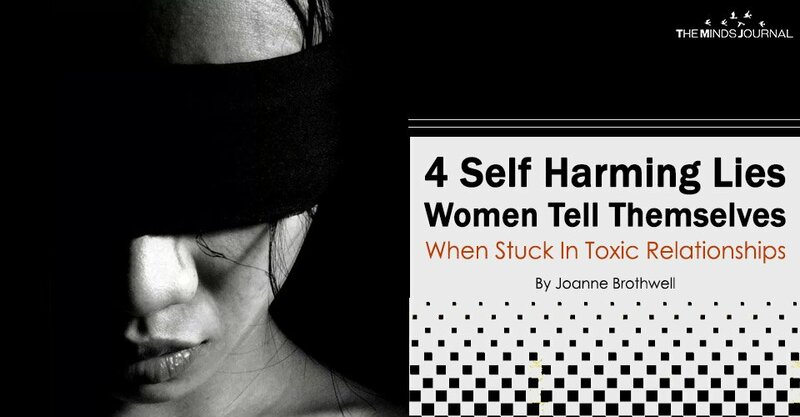 Here are four self-harming lies women in emotionally abusive, toxic relationships with men who have narcissistic personality traits tell themselves, so you can open your eyes to the truth. Deep down, at your core, you believe all inner deficiencies can be healed through your unconditional, dauntless love. If you are hanging on to the ideal of saving the relationship and helping your partner heal with the power of love, think again. What you’re really doing is providing an endless fountain of narcissistic supply, continual attention to feed this toxic condition. They keep you busy, involved, and preoccupied with their games, mind tricks and manipulation. They consume your mind space. Like a tick, they’re under your skin, emotionally bleeding you of health, happiness, and wellbeing. Your dauntless love is merely providing the life support for this malignant condition and it’s eating away at all of your healthy parts until eventually all of you will be devoured, and there will no longer be anything left. People who go through tough times may have short-term changes in behavior, but when behavior follows a consistent pattern of kindness followed by cruelty over time, you know this is not them merely struggling with a tough issue, but someone who has a persistent, long-term pattern of abnormal — and abusive — behaviors and personality traits. What’s really going on is that you can’t let go of the image of the person you thought they were, but they are who they’ve always been. Is he interested in how you feel? Does he respond with concern when you point out how hurt you feel after an argument? Does he validate your opinions when you describe your frustration with the relationship? Or, does he minimize your feelings and tell you it’s in your head? Understand the difference between giving up and knowing when you’ve had enough. The two are very different. Know when you’ve had enough and find the strength to set boundaries. This is difficult if you are a person who sticks with things, through good times and bad, through sickness and health. You believe these are truths, that there are no true reasons to give up or give in, because to do so admits personal defeat. Failure. This thinking will only keep you stuck. Quite likely you’ve been successful at most things you’ve put your mind to. You likely have set a goal and achieved it through hard work, determination, and perseverance. You’ve lived by the old adage, Shoot for the moon. Even if you miss, you’ll land among the stars. Saving your relationship is just one more goal to achieve, and you will achieve it. Even if it kills you. Don’t let it. You can’t save this relationship. You’re not setting your sights on the moon; you’re setting them on another solar system. The narcissistic abuser cannot be cured by love, compassion or unwavering commitment. Joanne has over twenty years of experience as a therapist helping people overcome obstacles, improve their lives and achieve greater happiness. Using evidenced-based interventions, she provides therapy and coaching for individuals, couples, and families. Joanne holds a master's degree in clinical social work and is a certified professional coach. Joanne approaches her counseling work from the lens of a therapist and as an individual who has experienced the devastation of psychological abuse.